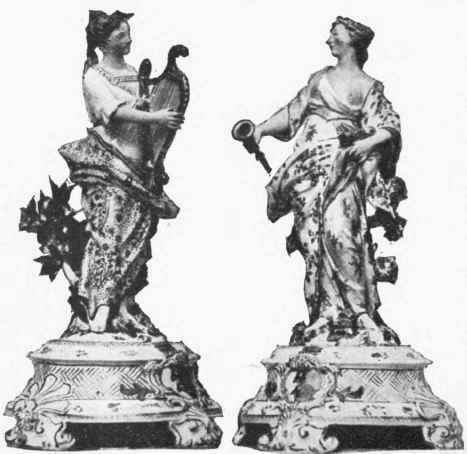 The previous article pointed out the con-nection between the great porcelain industry in China and the beginnings of the same industry in Europe. It dealt with the tragedy of the potter groping in the dark to elucidate the mystery of paste and glaze. It was also an endeavour to assist the would-be collector by explaining the difference between pottery and porcelain. Towards the middle of the eighteenth century porcelain was first made in England. It was not the hard paste, or true porcelain, such as was manufactured in China, but a soft paste, translucent and beautiful to the eye and touch, but very difficult to work upon, and easily drawn out of shape in firing. Such was the porcelain made at Chelsea. The terms "hard paste" and "soft paste" are apt to puzzle a beginner, and it is only by learning the difference in the composition of the two "bodies" that she can distinguish between them. Soft-paste porcelain was composed of a large proportion of glassy grit and sand, and a small quantity of white clay and bone-ash. The glaze employed with it was very fusible and glassy, being made from red lead, nitre, and sand. A future article will deal with the ingredients of "hard paste." For the present it must suffice that Chinese porcelain is hard. Upon it a file will make no impres-sion.but the Chelsea body it will powder. If the bottom of a Chelsea figure be examined, three or four whitish-brown marks will be observed. These were caused by the struts upon which it rested in the kiln, and are called "thumb-marks." Portions of the base are generally unglazed, and if the eyes are shut and the fingers passed over the unglazed surface it will be found to be soft and smooth. Dishes, plates, cups and saucers do not generally bear the thumb-marks, but three little wart-like blisters take their place. These were caused by the tripod in the kiln. The glaze of Chelsea porcelain is very glassy, and is of a pale green colour. It will be found in tears and thickly accumulated under the base. It is not at all unusual to find a lump of glaze standing out upon the surface of a plate or dish, over which a leaf, flower, or insect has been cunningly painted to hide the defect. 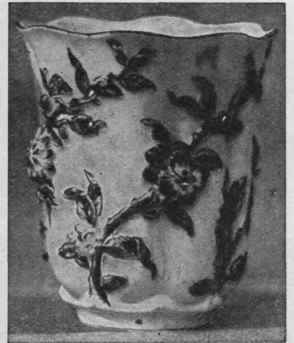 The date of the establishment of the Chelsea factory is not known, but the existence of a small milk - jug dated "Chelsea 1745 "proves that at this time porcelain of superior quality was being made there. A characteristic of the first period was the absence of gold in the decoration both upon figures in the drapery and the rims of dishes, plates, cups, and saucers. These were generally edged with a line of dark red or chocolate colour. Early forms of decoration were copied from the Chinese and Japanese, and tea-services of sexagonal shape were much made at Chelsea at that time, the most famous being one at the British Museum painted with scenes from Æsop's fables. From the beginning first-class artists were engaged at Chelsea. Soon simple forms gave way to more elaborate designs, and detached groups of flowers, butterflies, and insects gave place to brilliantly painted exotic birds, fine landscapes, and heavy gilding. The three magnificent dishes in the Victoria and Albert Museum are fine examples of this later period. These are the kind of specimens so successfully copied in Paris that it is only by knowing the characteristics of the Chelsea body and glaze that they can be detected as forgeries. At one time Chinese porcelain which had been brought over to this country in the white was decorated at Chelsea, the principal forms being exotic birds or sprays of flowers, insects, and caterpillars. Chelsea figures are very desirable possessions. More than forty varieties are mentioned in the old catalogues of the firm. Early specimens were either without gilding or were only sparingly gilt. In addition to these, many little toys intended to be used as miniature snuff-boxes and scent-bottles were made. Basket-dishes with twisted handles and encrusted with raised flowers, bell - shaped mugs and sauce-boats moulded in relief and painted with flowers, foliage, and insects, are well-known products of the Chelsea factory, in addition to tea and dinner services. 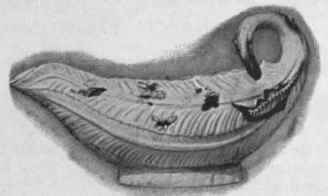 But some of the most noticeable pieces are swans, rabbits, and birds, beautifully modelled and often of large size; cabbages, cauliflowers, and bundles of asparagus, faithful copies of Nature, are also characteristic of this factory. 1759, tourquoise blue in 1760, and the wonderful claret colour, which became so famous, in the same year. In 1769 Mr. Nicholas Sprimont, who owned and managed the Chelsea factory, retired, and the works were bought in the following year by William Duesbury, of Derby. For some time Duesbury carried on the two factories, and the porcelain made from this time till 1784, when the works were closed and the plant transferred to Derby, was known as Chelsea-derby. The earliest regular mark used at Chelsea is an anchor in relief on a raised embossed oval, but on a few pieces of quite the earliest period an incised triangle is found, and the word Chelsea in script characters. A very rare mark is the anchor raised in red-brown on white. 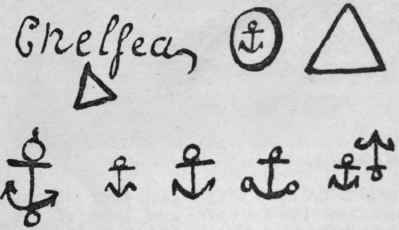 The anchor in red, puce, or gold is the most usual Chelsea mark, and the gold anchor is the mark generally made use of by the forger. The size of the anchor varies as does its form, and sometimes it may be found in a fold of the drapery of a figure, when it will be of very small size. Two anchors frequently occur together, one of which is painted upside down. A triangle alone, incised in the paste, is sometimes, but very rarely, found on a piece of Chelsea china of early date. The forger, it is said, has been known to mark his wares, notably woolly lambs, with an anchor in blue, but as this colour was never used as a mark at Chelsea, pieces so marked need not deceive anyone. An anchor was used as a mark in the china factory at Venice, but this was so much larger than those used at Chelsea that it should not mislead the collector.